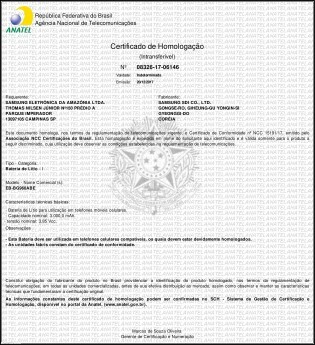 Brazil’s National Telecommunications Agency (aka ANATEL) has published its certificates of the Samsung Galaxy S9 and Galaxy S9+. The document contains some legalese, but the juicy bit is the battery capacity. The S9 will have a 3,000mAh battery while the S9+ model will pack 3,500mAh. Same as last year, basically. The nominal voltage is the same (3.85V), meaning the two phones will have 11.55Wh and 13.48Wh in their respective batteries. The battery model numbers match the ones reported by the FCC – EB-BG960ABE and EB-GB965ABE. Note that the “G960” part matches the phone’s model number. The new Galaxy S9 duo will come with new chipsets – Snapdragon 845 and Exynos 9810 – which are more power efficient than the current selection of chips. The Qualcomm chip for example promises a 30% better power efficiency. my LG G2 from 2013 has 3000 mAh battery too. Seems that 5 years later there is no much of improvement on battery size. 3000mah seriously???? My htc one m8 2014 had 2600mah battery.